Today we learned about polite non-past verbs in Japanese! This verb form is commonly referred to as the ます (masu) form because verbs in this form always end in ます! In this review we will go over the concepts from the video and see some more examples. What is a polite non-past verb? ★　In Japanese there is a polite form of verbs and a casual form of verbs. 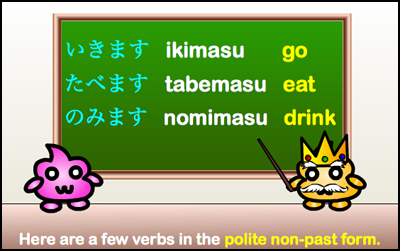 ★　Today we learned the polite form of verbs, also known as the ます (masu) form of verbs. 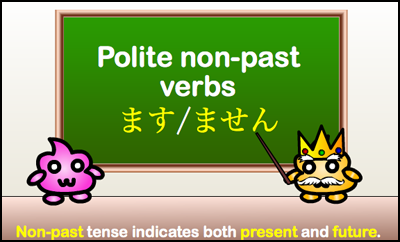 ★　Japanese has 2 verb tenses: past and non-past. Non-past indicates both present and future. This means that the same sentence often has two possible translations. You can understand if it is being used for the present or future by the context of the sentence. ★　We learned both the affirmative and the negative forms of these verbs. ★　We learned three verbs in the polite non-past form. 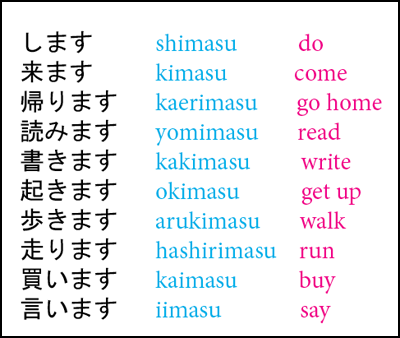 ★　Verbs in this form always end in ます (masu). ★　がっこうにいきます can mean either “I go to school” (present) or “I will go to school” (future) depending on the context of the sentence. 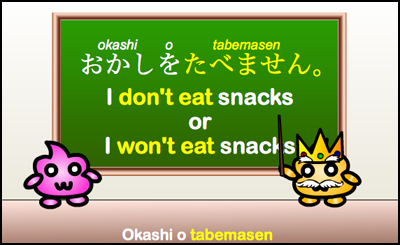 ★　おかしをたべます can mean either “I eat snacks” (present) or “I will eat snacks” (future) depending on the context of the sentence. ★　ジュースをのみます can mean either “I drink juice” (present) or “I will drink juice” (future) depending on the context of the sentence. 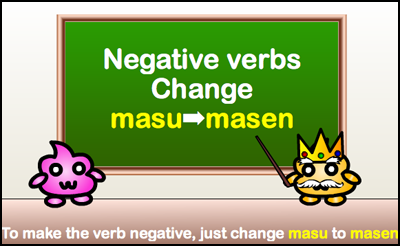 ★　To make the verb negative, we can change the ending ます (masu) to ません (masen). ★　To make this sentence negative we changed the ending of the verb from ます (masu) to ません (masen). Kyō wa tomodachi to asobimasu. Today I will hang out withmy friend. Watashi wa terebi o amari mimasen. I don’t watch television very much. Today we learned about the polite non-past form, AKA the ます (masu) form of verbs. We learned that these verbs always end in ます, unless they are negative in which case they end in ません (masen). The non-past form indicates both the present and the future. When do you need to use watashi? For example “Watashi wa terebi o amari mimasen” versus “Nihongo o benkyō shimasu.” and does it work the same for he/she? The use of watashi (I) or kare/kanojo (he/she) are usually considered optional. In most cases, it is correct whether you use it or not. For example, “Watashi wa nihongo o benkyō shimasu” is ok, but it is often shortened to “nihongo o benkyō shimasu” when it is obvious from the context that you are talking about yourself. Similarly, if you are talking about someone else and he has already been mentioned as the topic previously, then you do not need to put “kare.” Basically, if you can tell from the context who is the topic of the sentence, you can put it but you don’t have to. If it is not obvious from the context (like if you are changing the topic), then it is better to put it. Does that make sense(◕ω◕)? Ah thank you so much for the speedy and detailed response, that makes perfect sense!! btw unrelated but i love the food recommendation emails Tamagoyaki is really easy to make and good! I have a question.Is there a difference between the present tense and present continous tense? Yes! There is a difference. We have not yet written about the Japanese present progressive (present continuous), but it is fairly simple if you know how to make the -te form of the verb. 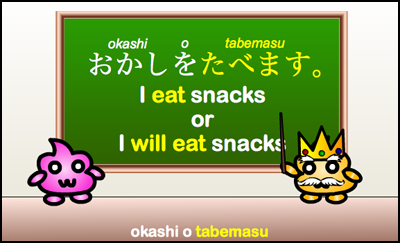 For example, 食べる (taberu [plain form]) / 食べます (tabemasu [polite form]) is the present tense verb “eat”. It’s -te form is 食べて (tabete). To make the present progressive form, you just add -iru (or -imasu for polite speech) to the end of the -te form. So, the present progressive of 食べる (taberu) is 食べている (tabeteiru [plain form]) or 食べています (tabeteimasu [polite form]) which means “eating”. The present progressive is formed by using the -te form of the verb plus “iru” (or “imasu”). You’re right, it’s probably not a literal translation (that is not to say that it is necessarily a bad translation – sometimes the literal translation doesn’t sound as good). Yurari is an adverb that means “swaying” (only once, in a large, slow motion). Yureru is the plain form of the verb meaning “to sway”, so literally it would translate as “sway” or “sways” (◕ω◕)♪ If you want to form the present progressive verb “swaying” a literal translation would be “yureteiru” (-te form + iru). It is the same with other verbs as well☆ “Utau” (sing/sings) would become “utatteiru” (singing) and “hashiru” (run/runs) would become “hashitteiru” (running). I hope that helps (◕ω<)♥ We will try to make a video about the -te form of verbs soon, and about the present progressive! How do you use sentences with two verbs in it in japanese. For example: “I eat fish” would be 魚をたべますin japanese, and “I like fish” would be さかながすきです. (correct me if I’m wrong). But how do I combine them so i can say the sentence “I like eating fish” in japanese ? Thank you very much. I think I understand it now. For Example how would the sentence:”I saw the children playing in the garden” translate into japanese ? How would you say “I want/don’t want to (do something)” and “I can/can’t (do something)”? Eg: I want to eat, I can’t speak Japanese. This is a little unrelated, but I wanted to know really bad. You showed us “Gakko ni Ikimasen” earlier, and in the writing of it, after the ga part, there was a little symbol that sort of looked like Tsu. However, it obviously isn’t. Could you tell me what that is? You can say “ashita kuji ni okimasu.” You do not need to say “watashi” (I) every time in Japanese like you do in English.